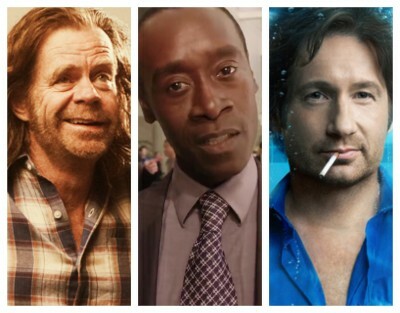 Showtime has set the returns of three of their TV series — Shameless, House of Lies, and Californication. Shameless is returning for its third season. It’s unknown how many episodes have been ordered this time around but, as there often is with Showtime series, there were a dozen installments in season two. They finished airing on April 1st and averaged a 0.7 rating in the 18-49 demographic with 1.36 million total viewers. House of Lies will be back for its second season, following a 12 episodes first season. Paired with Shameless and Californication, the series averaged a 0.4 in the demo with 0.83 million viewers. Californication is returning for its sixth season, presumably with another dozen installments. The fifth season also finished airing on April 1st with a 0.4 demo average and 0.72 million viewers. LOS ANGELES, CA – (September 17, 2012) – To kick off the New Year, SHOWTIME will debut all-new seasons of SHAMELESS, HOUSE OF LIES and CALIFORNICATION on Sunday, January 13, 2013. The fun begins at 9 p.m. ET/PT with the third season of SHAMELESS. It’s several months after the last season ended and the Gallaghers are each seeking their own unique version of the “American Dream.” Jimmy (Justin Chatwin) has moved into the Gallagher home, and Fiona (Emmy Rossum) soon realizes that a GED will only get her so far and that a long-term relationship with Jimmy isn’t as fulfilling as she expected. Meanwhile, Frank (William H. Macy) reappears south of the border with no idea as to how he got there. Based on the long-running hit UK series, SHAMELESS is executive produced by Emmy(R) Award-winning television and film producer John Wells, as well as Paul Abbott and Andrew Stearn. Wells developed the series for American television. The second season of HOUSE OF LIES follows at 10 p.m. ET/PT. Starring Oscar(R)-nominated actor Don Cheadle in his Emmy-nominated role as Marty Kaan alongside co-star Kristen Bell, this series is a timely comedy that dives head-first into the shark tank known as corporate America. Marty is the big-money earner at Galweather Stearn, who commands a hot, young team known as The Pod: Jeannie (Bell), Clyde (Ben Schwartz) and Doug (Josh Lawson). Marty and The Pod’s work life revolves around first-class travel, top-shelf liquor and anything they can charge the client on a black Am Ex. Marty is the ultimate power player and under his direction, this ruthless, pull-no-punches team is here to beat the corporate suckers at their own game – and they’re loving every minute of it. This season, The Pod – especially Marty and Jeannie – must deal with the fall-out from the big merger showdown. Meanwhile, Marty is thrown by the arrival of a new ‘frenemy’ at work and by Roscoe (Donis Leonard Jr.), who decides to move in with his lunatic mother, Monica (Dawn Olivieri). The series is based on the hit tell-all book from best-selling author Martin Kihn (House of Lies: How Management Consultants Steal Your Watch and Then Tell You the Time). Produced by SHOWTIME, HOUSE OF LIES is created and executive produced by Matthew Carnahan. Jessika Borsiczky, Stephen Hopkins and Don Cheadle also serve as executive producers. At 10:30 p.m. ET/PT, the sixth season of CALIFORNICATION returns with David Duchovny in his Golden Globe(R)-winning role as hedonistic novelist Hank Moody. Moody continually struggles to be a good father to his college-aged daughter Becca (Madeleine Martin), while still carrying a torch for her mother, and his ex-girlfriend, Karen (Natascha McElhone). This season, noted actress Maggie Grace (Lost) has signed on for nine episodes as the infamous rock groupie Faith, who develops an unconventional relationship with Hank. She is joined in two episodes by her former Lost co-star Jorge Garcia as an old contact from Faith’s past. International comedy star Tim Minchin takes on the role of Atticus Fetch, a mad-as-a-hatter rock star who will write the music for the Broadway production of Hank’s hit novel. Fetch enlists the ever-cynical Hank to collaborate on the project, which he calls “…a rock opera about love conquering all.” Notorious rocker Marilyn Manson will also make a guest appearance. CALIFORNICATION is created and executive produced by Tom Kapinos and executive produced by Duchovny. What do you think? Are you looking forward to the return of these Showtime series? Do you prefer one over the other? Do you think it’s time for Californication to end? Hell no Californication shouldn’t end yet!!! I love Hank Moody and the Runkels. It would ruin my Sunday nights.